In most decent-sized European cities there’s at least one fashion-forward, design-centric boutique hotel. In the United States, they’re mostly confined to the coasts. That won’t be true for long, though, especially if NYLO Hotels has anything to say about it. 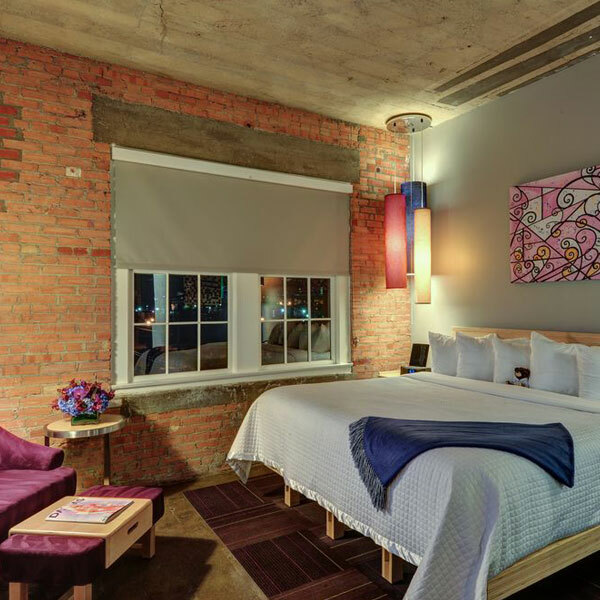 They’re as likely to move into Dallas’s South Side as New York’s Upper West Side — and it turns out that an eco-friendly hotel with a slight rock-and-roll edge plays just as well in both places, especially when, like the NYLO Hotel Dallas South Side, it’s got loft-style rooms and a busy rooftop bar. 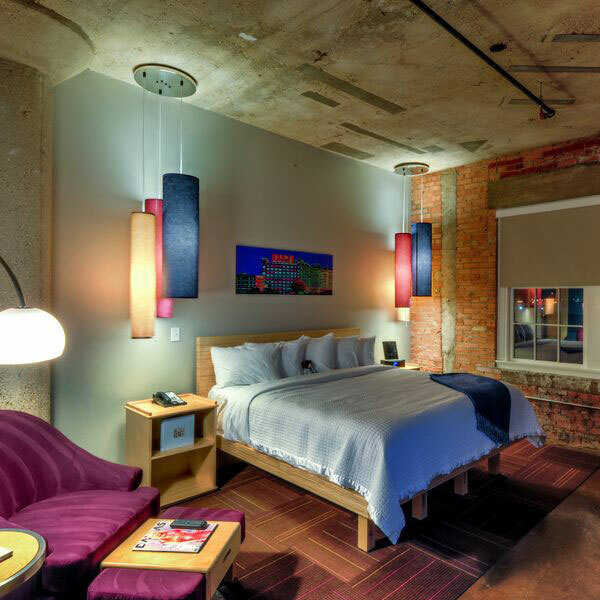 Framed by polished concrete floors and exposed brick walls, these 76 rooms and eight suites scream cool — if you haven’t been to Dallas lately, you might be surprised to see that there’s nothing at all provincial about the interior design. 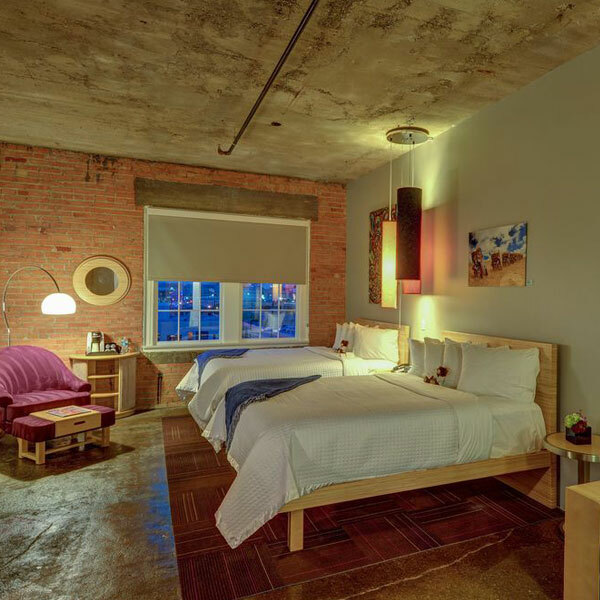 The loft-style rooms feature high ceilings with huge picture windows, locally produced artwork, beds crafted with blonde wood, colorful glowing lanterns, and large flat-screen televisions. Amenities are plentiful across categories, from the custom NYLO mattresses and Kohler high pressure shower heads to coffeemakers, cozy ottomans, and iPad-compatible alarm clocks. Suites come with Bose stereo systems and space — a lot of it — the Austin, Lamar, and Skyline suites are each composed of two adjoining suites, and feature two full baths. Take a hint and reuse your towel instead of throwing it on the floor. The NYLO Dallas’s attention to green matters isn’t just for show — the hotel’s scored LEED Gold Status. 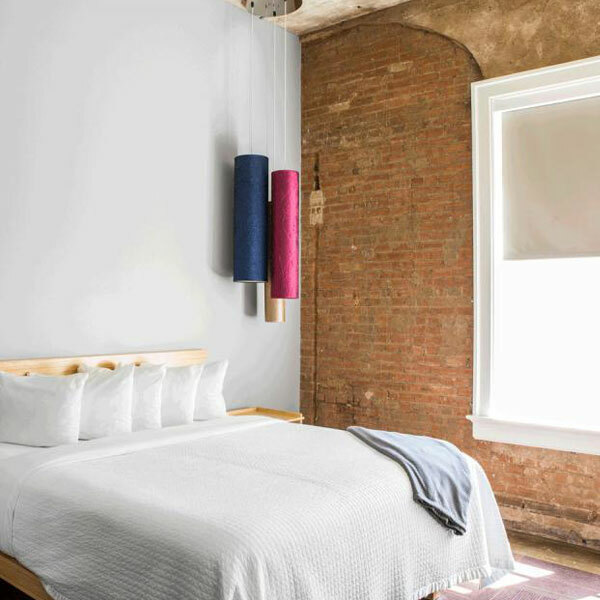 It would be tempting to linger in a hotel room as appealing as these, but most guests are at the NYLO as much for the hip nightlife scene as for the sheets’ high thread count. There’s responsibly sourced seasonal cuisine at the charmingly rustic Terrace Bistro, the ideal lead-in to cocktails at the hotel’s crowning glory — the rooftop SODA Bar. Complete with an outdoor swimming pool and magnificent views over the city skyline, the lounge-like space draws a mix of fashionable locals and hotel guests. From here, you can walk downtown, or catch live music at various venues in the nearby South Lamar/Cedars neighborhood. Or you can just stay put: the party is already here. Please note: The minimum age to check-in is 21 years old.